Properties in Lokwerk Shopping Centre average 4.4 out of 5 stars. HESSE HERE, DIED THIS ... 'THE HÖRI' WILL INSPIRE YOU! Property 12: HESSE HERE, DIED THIS ... 'THE HÖRI' WILL INSPIRE YOU! What a wonderful apartment and what a view! 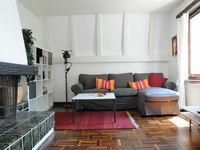 The penthouse apartment is very clean, comfortable and convenient to visit Zurich! The location is perfect for visiting...... you can cross the street to walk along the lake and the bus stop is right outside the building. The only thing we missed was a television..... that would have made our stay perfect. Thank you for sharing your apartment! We loved this charming and well appointed apartment in the Oerlikon neighborhood. The location was great in between downtown Zurich and the airport. The upstairs suite was perfect for our boys and we enjoyed the downstairs BR and great shower! Julie and Monica are fantastic hosts and their guide to the apt and the surrounding area was put to good use.